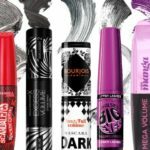 I have been using Clinique since I was 23 or 24 and I love all the products I could afford to buy. DDML was the most affordable, and by far the most popular product. It’s lightweight, absorbs quickly, smooths over dry spots, not intensive enough, fairly effective, can make breakouts worse, doesn’t even skin tone very much, doesn’t sooth sensitive skin, has no anti aging properties and no SPF, so lack of all these qualities actually makes it expensive, since it mainly consists off mineral oil, the cheapest and not the safest skin product out there. Many companies stay away from mineral oil, and if I recall correctly, back in the 80’s DDML’s formula was predominantly based om seasam oil, which is now the secondary ingredient. If you have combination skin like me, it’s a great way to smooth over dry spots to make your skin tone more even. However, there are many drawbacks to using this product, and over the years I’ve found other moisturizers that are far more effective. >If your skin is so dry that it’s red and peeling (like from a sunburn, winter dryness, a cold, etc.) 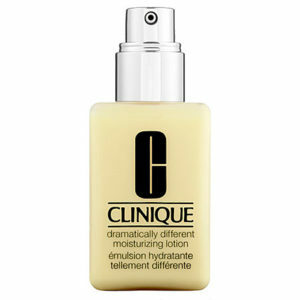 then you’ll want to use a moisturizer that is more intensive and works better than this one does. I have several recommendations,two of which are available from Sephora, the first being RareMinerals facial moisturizer. 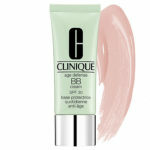 It not only smooths over dry spots, it soothes sensitive skin and doesn’t make oily areas worse. 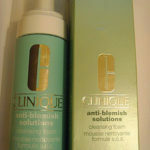 It also evens skin tone much better than this Clinique moisturizing lotion does. The second product I’d recommend is Philosophy Hope in a Jar for Dry and Sensitive Skin. It also is far more effective at moisturizing dry skin and improving your complexion without causing or worsening breakouts. Essentially, this product does a decent job of moisturizing, but not outstanding. Considering how much better other products I’ve found work, I think this one is a little overated. And considering that this product’s results are nothing outstanding, I think it’s certainly overpriced. When I read the negative reviews for this product, I can tell that some people haven’t really been informed on how the product should be used. First of all, it really isn’t going to work to its full potential without the full 3-Step system. 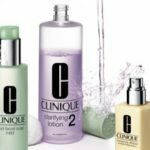 Some reviews said it didn’t seem to absorb very well – this is probably because Clinique soap is not being used to loosen dead cells and oil, and the appropriate Clarifying Lotion is not being used to sweep those cells away. Of course it can’t absorb if it’s just sitting on a layer of dead cells. Some people said it was too oily – most likely because they haven’t been skin typed and should be using the Dramatically Different Moisturizing Gel instead, which is oil-free and designed for people who produce enough oil on their own. Some reviews stated that it didn’t provide enough moisture for very dry skin. The 3-Step system is designed to balance your skin and prepare it to absorb any other products you may use, meaning that DDML is a very basic moisturizer. Clinique offers booster moisturizers (designed to be used in addition to 3-Step, including DDML/DDMG) for individuals who need additional moisture, anti-aging, SPF, etc. This why everyone should visit a Clinique Consultant who has been trained to help you find the right custom-fit skincare and who can inform you about how to use the products properly. Woah! I’m really enjoying the template/theme of this blog. It’s simple, yet effective. A lot of times it’s challenging to get that “perfect balance” between usability and appearance. I must say that you’ve done a awesome job with this. In addition, the blog loads very quick for me on Chrome. Excellent Blog! If you suffer from any skin spoilers, you don’t need to keep using product after product for weeks just to realize they don’t work. This is a comment to the webmaster. I came to your “My Review of Clinique&” page via Google but it was difficult to find as you were not on the front page of search results. I know you could have more visitors to your site. I have found a website which offers to dramatically increase your rankings and traffic to your site: http://nsru.net/zaj5 I managed to get close to 1000 visitors/day using their services, you could also get lot more targeted traffic from search engines than you have now. Their service brought significantly more visitors to my website. I hope this helps, happy new year!